July 15, 2017 By Chelsey Leave a Comment This post may contain affiliate links. Read my disclosure policy here. 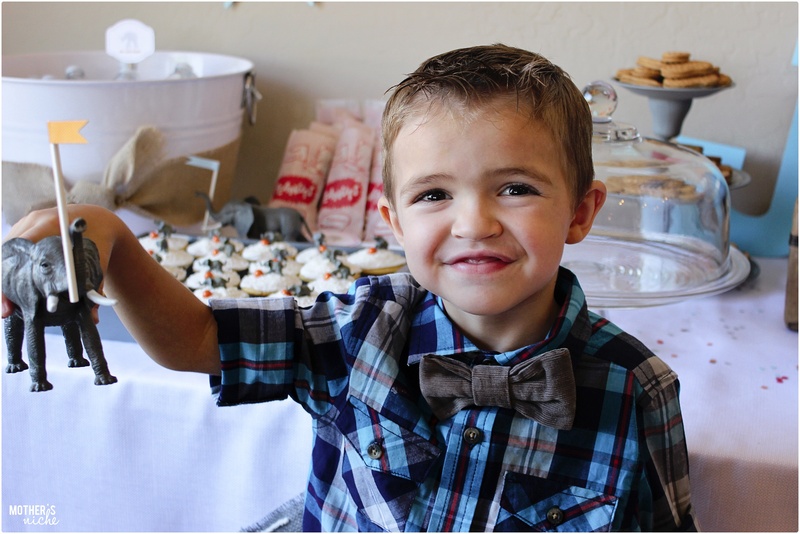 This little man is in love with ELEPHANTS! He wants to have an elephant for a pet. Someday we may have to make it to a circus and let him ride an elephant. 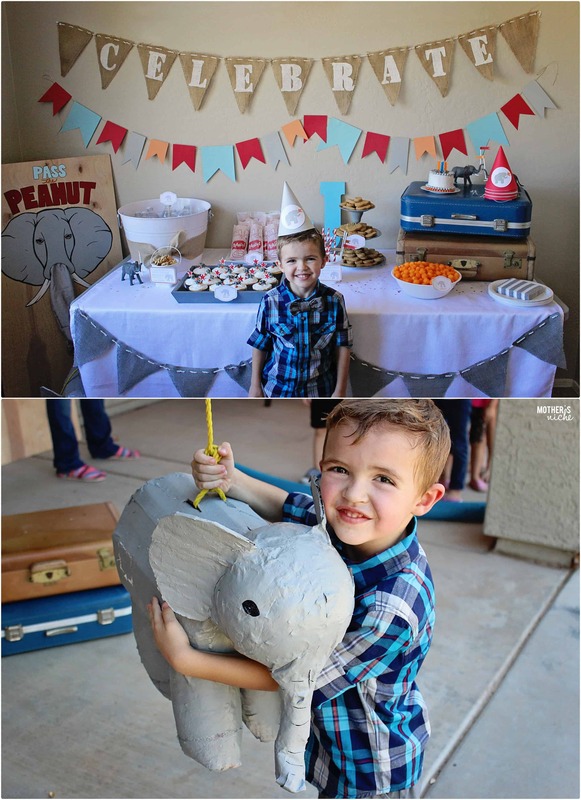 But, until then, we held him off with an Elephant birthday party. We had a fun time playing games and eating yummy snacks. Here is the Breakdown of the party! I found these tiny little Elephants and used them for the cupcake topper and used an orange pearl sixlet candy as a ball to balance on. As for decor, I used vintage suitcases, flags made of colored paper, wood letter “J”. Confetti and straw flags from scraps of the paper. I had to share one of my favorite quotes from a Dr. Suess character. I meant what I said and I said what I meant. 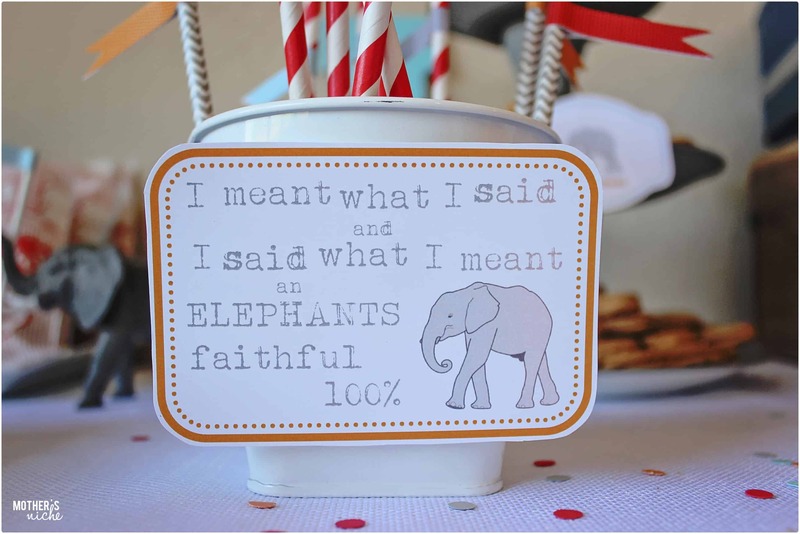 An Elephants faithful 100%- from Horton hears a Who. PASS THE PEANUT was a really fun game. 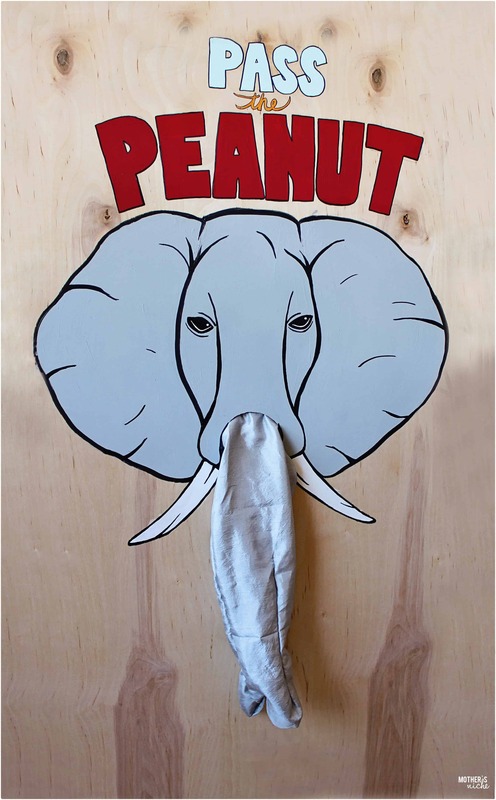 I painted the elephant on to a piece of 2’x 4′ birch plywood. I cut a 5 inch round hole where the trunk would be. Then I added a piece of grey cloth that I had sewn to the shape of a knee-high sock. I hot glued it in place. HOW TO PLAY: Each child took turns sticking their arm though the back of the wood to make the trunk move around. Once their arm was in place, one bucket with shelled peanuts and an empty bucket were placed in front of them. 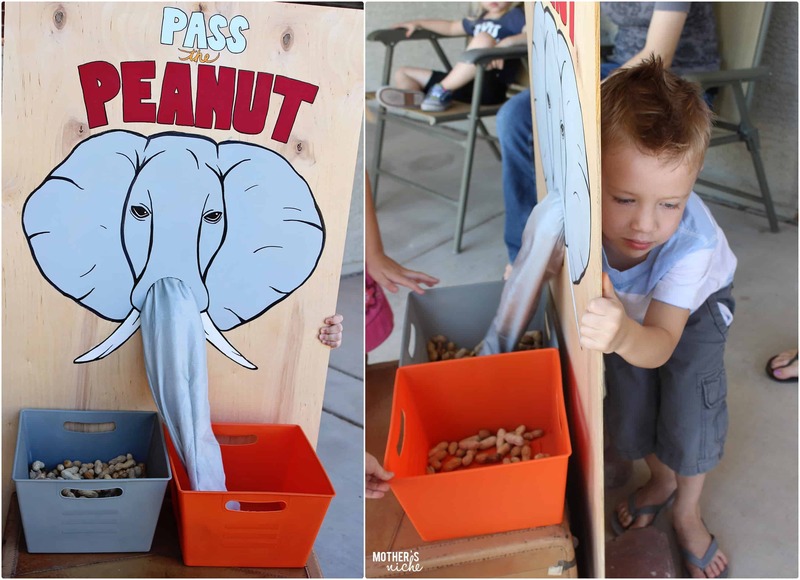 The object of the game is to move as many peanuts to the empty bucket as possible in one minute. Count and tally the results for each child. The one who moved the most peanuts was the winner. The CELEBRATE BANNER was burlap cut into triangles and stenciled the word with white paint. At the time of the party I could not find an elephant pinata anywhere, so I made one. The body was made out of strips and folded pieces of cardboard. The head I made by blowing up a balloon to a good size then put a lot of paper mache on the whole thing. Once dry, I painted the elephant gray. My son was sad that we were going to break it….. for 2 seconds! He quickly remembered there was candy inside. We had peanuts, nutter butter cookies, cheese puffs and sandwiches for lunch time treats. All of my son’s favorite treats! This adorable little guy is holding a cute Elephant that is raising a flag. 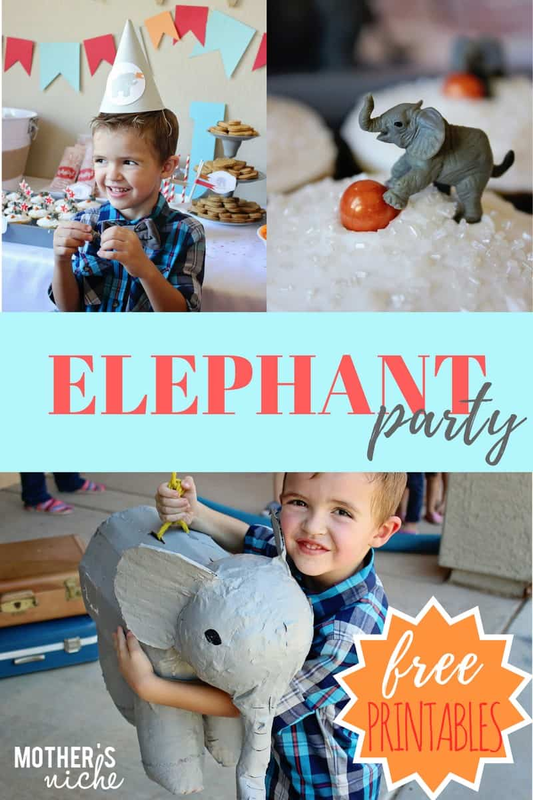 I thought it was a fun party and my son was in heaven, mostly because when we finished he got to keep all of the elephants. 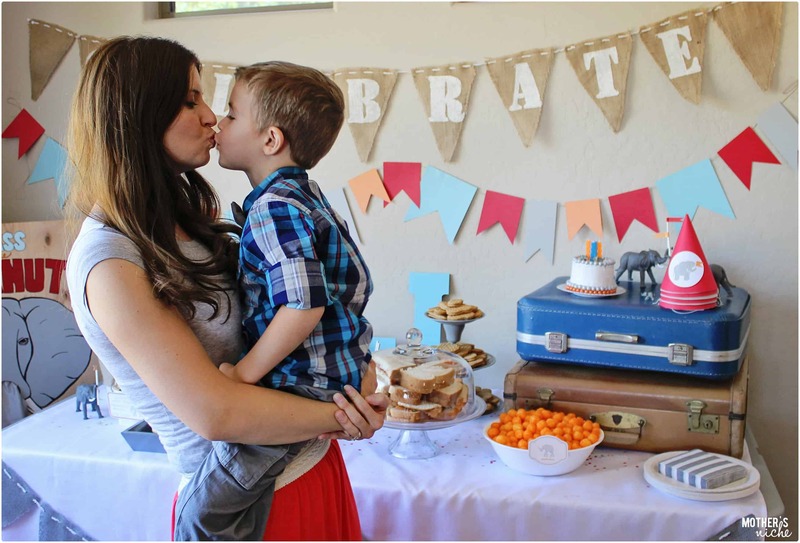 GET YOUR FREE PARTY PRINTABLES HERE! 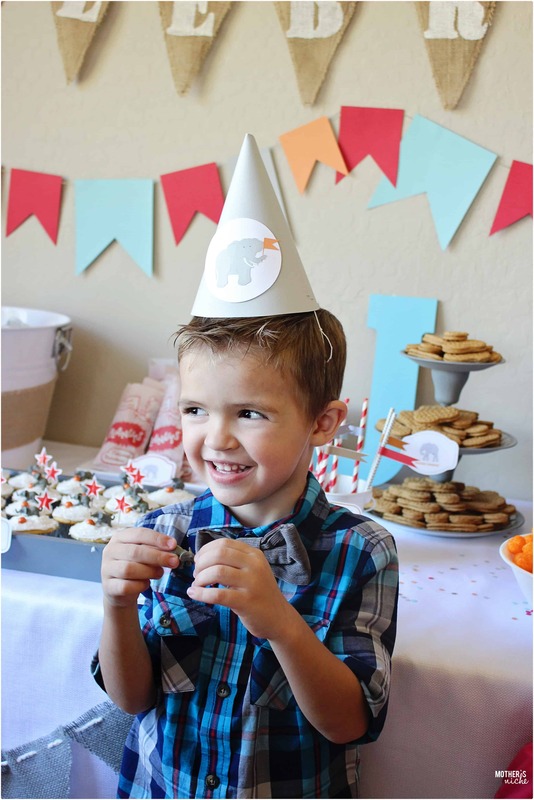 What would YOU add to your little one’s elephant party? !